According to latest research developed motor with superior performance and maximum efficiency. Ultra compact and very light. CAUTION: 3,5 mm gold connectors are only for continuous current 50A and short-term 70A for 10 sec. permitted ! 3s - 11V - 14,5x14 M35, 7316 rpm, 104 amp. 1152 watts, pitchspeed 156 km/h, Eta 79% - 15 sec. 3s - 11V - 15x16 RF thin, RF Spinner Versatz 0° M28, 7363 rpm, 94 amp. 1044 watts, pitchspeed 180 km/h, Eta 79,5% - 15 sec. 3s - 11V - 16x16 RF thin, RF Spinner Versatz 0° Spinner M28, 6927 rpm, 124 amp. 1374 watts, pitchspeed 169 km/h, Eta 75,6% - 10 sec. 3s - 11V - 19x8 RF, 7017 rpm, 126 amp. 1402 watts, thrust 6558g, pitchspeed 86 km/h, Eta 76,6% - 10 sec. 4s - 14,8V - 11x22 GM M35, 9996 rpm, 108 amp. 1601 watts, pitchspeed 335 km/h, Eta 79,7% - 10 sec. 4s - 14,8V - 12x17 RF M28, 9902 rpm, 114 amp. 1694 watts, pitchspeed 257 km/h, Eta 79,3% - 10 sec. 4s - 14,8V - 12,8x13 RF M39, 10063 rpm, 104 amp. 1537watts, pitchspeed 199 km/h, Eta 80% - 10 sec. 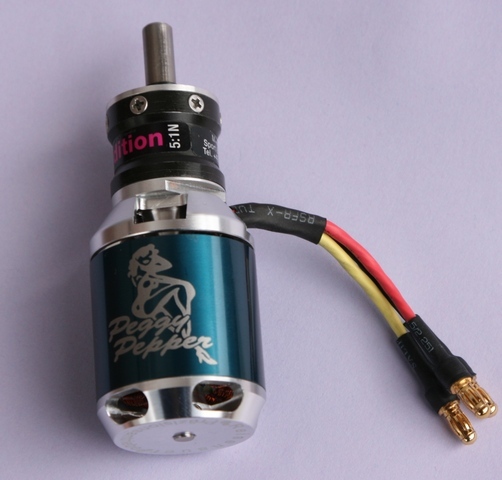 4s - 14,8V - 12x17 RF M28, 8699 rpm, 76 amp. 1132 watts, pitchspeed 225 km/h, Eta 80,3% - 15 sec. 4s - 14,8V - 14x10RF M48, 9501 rpm, 142 amp. 2097 watts, thrust 5673g, pitch. 145 km/h, Eta 77,2% - 7 sec. 4s - 14,8V - 14,5x14 M28, 9433 rpm, 146 amp. 2167 watts, pitchspeed 201 km/h, Eta 76,8% - 7 sec. 4s - 14,8V - 15x16 thin, RF Spinner Versatz 0° M28, 9331 rpm, 149 amp. 2218 watts, pitchspeed 227 km/h, Eta 76% - 7 sec.